Federal agents in New York on Wednesday moved to seize a thousand-year-old Cambodian statue from Sotheby’s, alleging in a civil complaint that Sotheby’s had put the 10th-century figure of a mythological warrior up for auction despite knowing that it had been stolen from a temple. Investigators said the sandstone statue, whose return is being sought by Cambodia and which is valued at $2 million to $3 million, would be impounded on Thursday by agents from the United States Department of Homeland Security. 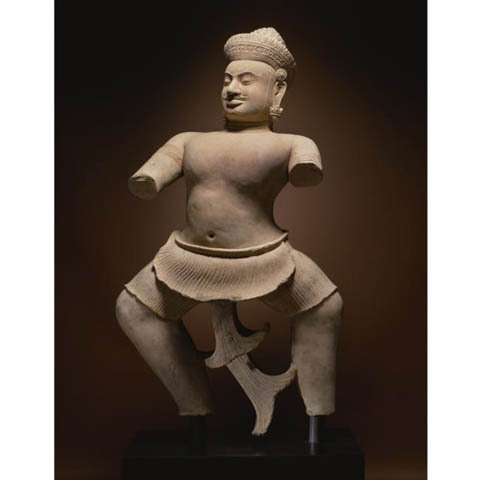 The statue, consigned to Sotheby’s for sale by a Belgian collector, had been set for auction in New York in March 2011 but was abruptly pulled from the market at the last minute after Cambodia claimed ownership. At the time Sotheby’s rejected Cambodia’s efforts to recover the Khmer antiquity, insisting there was no proof that it had been looted and therefore the auction was legal. But in a series of internal e-mail exchanges obtained by investigators and included in the federal complaint filed Wednesday in United States District Court in New York, at least one Sotheby’s officer is depicted as having been told in 2010 by a scholar in Cambodian art that Cambodian officials considered the statue a looted artifact. With evidence that Sotheby’s was told the statue had been looted, the Federal agents have a powerful piece of evidence they did not have in the Ka Nefer Nefer case. I would expect the unnamed Belgian collector who put the statue up for consignment to consider relinquishing the statue quickly. If it was purchased in good faith, he or she has a good claim against the dealer they bought it from. How long new before the Norton Simon is pressured to return its version of the statue? Ralph Blumenthal & Tom Mashberg, Ancient Cambodian Statue Is Seized From Sotheby’s, The New York Times, April 4, 2012, http://www.nytimes.com/2012/04/05/arts/design/ancient-cambodian-statue-is-seized-from-sothebys.html (last visited Apr 4, 2012).